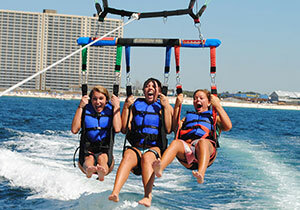 Go parasailing in Panama City Beach and get a bird’s eye view of the World’s Most Beautiful Beaches!! Fly in the air with Paradise Watersports! 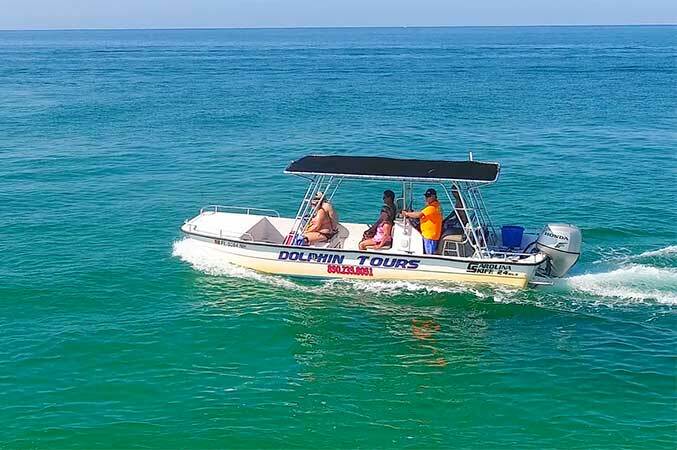 You can go parasailing in Panama City Beach alone or in tandem, usually up to the Captain’s discretion, so bring your friends and family and make this a parasail ride to remember. They will be chatting about it for months!! The whole experience takes approximately 1 hour from the time you leave to the time you get back. A 1 mile ride and 1 dip on 600ft of rope (optional extension of time and number of dips available at time of purchase). 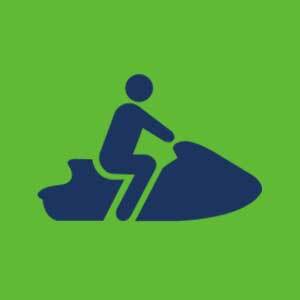 At Paradise Watersports, your satisfaction is a top priority, but your safety, is our #1 priority! 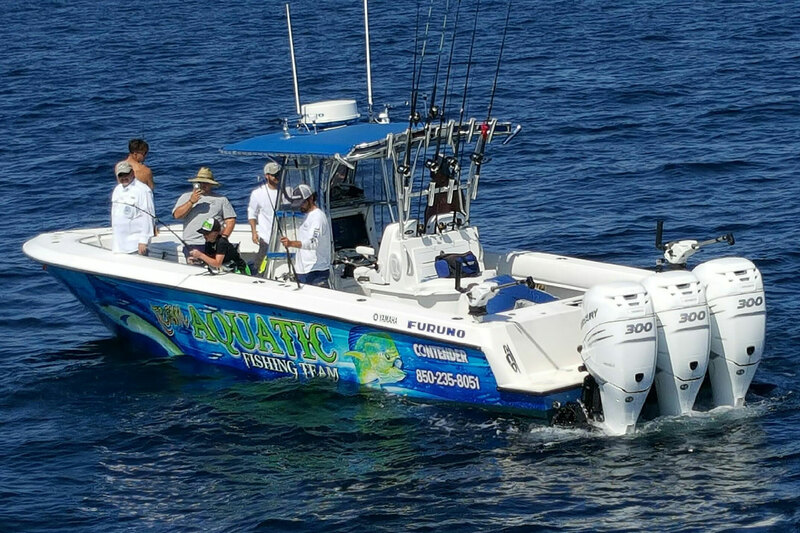 Our boats have complete hydraulic winches that ease you into the air right off the back of the boat and then reel you back in when your ride is complete. It’s like flying a kite with a fishing pole. We do it all! From the take-off on the back of our parasail boats to a perfect landing. Our crew is there to take care of YOU! 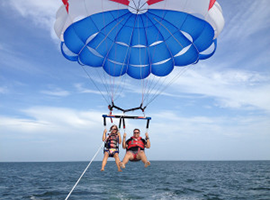 We provide the best parasail rides on the beach. 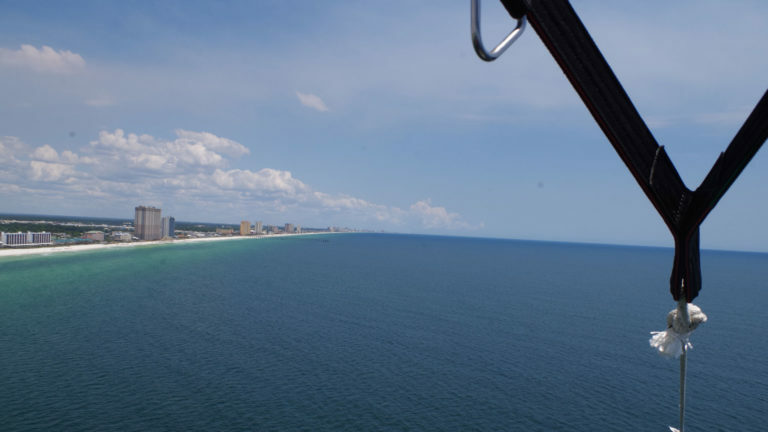 Take in the beauty of Panama City Beach from a whole new perspective…above! 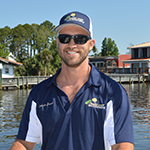 He is a USCG licensed Captain with 9 years of parasailing experience. 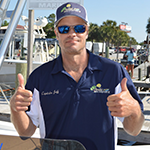 Marvin is a husband and father of beautiful little girl which he enjoys spending time with when he is not on the boat. He also enjoys fishing. Come out and meet him. and this great country he lives in: America! James has been in the industry since 1988. Also serves on the WSIA as a commitiee member. 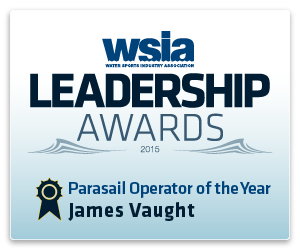 Works closely with USCG and FWC in regards to Parasail Risk management and best practices. 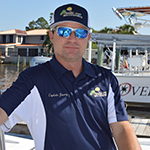 James also has spent the past 6 years working with a group to develop International Parasail Saftey Standards and crrent Florida state parasail laws that govern us today. 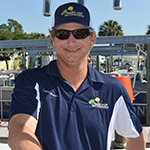 He also hosts annual meetings with USCG, FWC and any Parasail operators who wish to take part in the meeting. Can our group bring bags or camera? Can 3 people fly together? Is there a price difference if two or three people fly together? Are there restrictions on weight? How do we get into the air? What happens if the boat stops suddenly while we are in the air? Do we ever touch the water? Can we pick our flying partners? 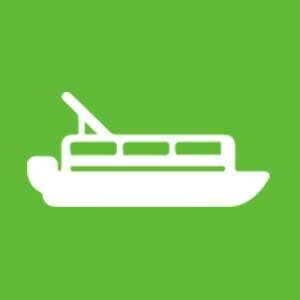 Can we have observers in the boat who aren’t flying? 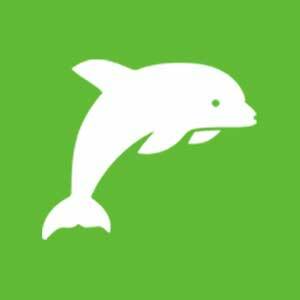 Do you take pictures of our experience? Swimwear works best. Wear whatever is comfortable for you. No, our insurance will NOT allow cameras, cellphones, coolers, or bags. Photo and Video packages are available. It just depends on wind conditions and weight of fliers. 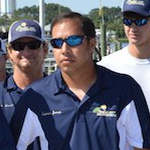 The captain has the final decision depending on the wind and weather conditions. The majority of flights are tandem or triples due to weight restrictions. The prices are all per person and depend on the package chosen. Yes, minimum age to parasail is 5 yrs old. Participants under the age of 18 must have a parent or guardian to sign their liability waiver prior to boarding the vessel. Unfortunately our insurance will NOT allow anyone that is pregnant to parasail or even board the boat as an observer. We would love to fly you at a later date. Anywhere from 90lbs.- 450lbs. 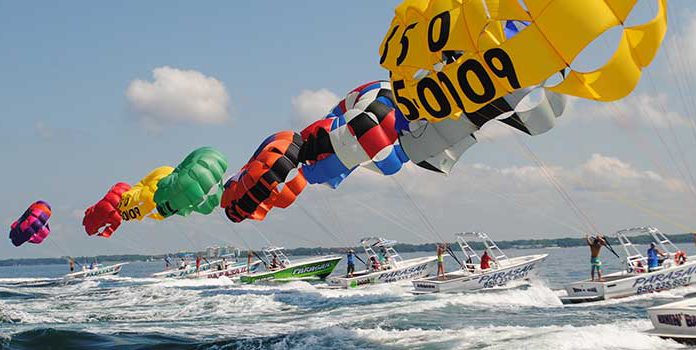 depending on the wind conditions, that increase and decrease throughout the day, will determine the amount of weight needed in the Parasail. 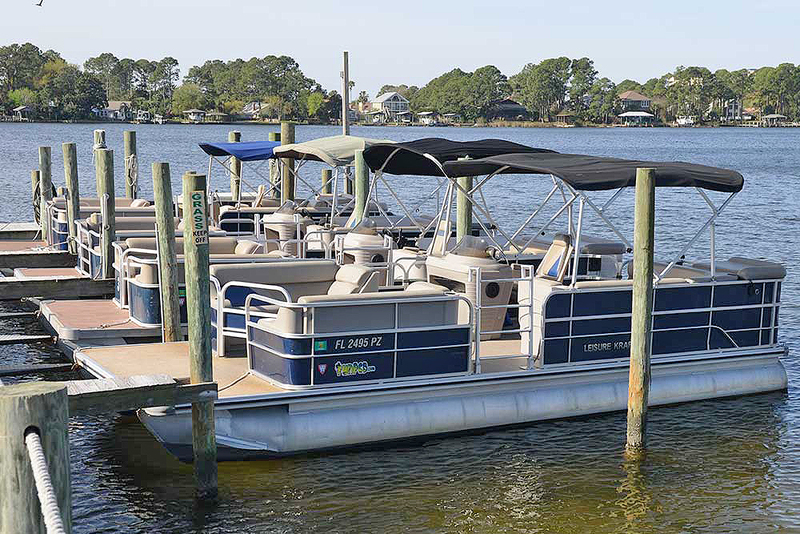 You will slowly be lifted off the back of the boat from a seated position, enjoy the ride with swing-like harnesses. 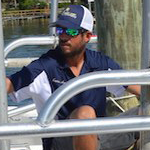 After your flight you will than slowly descend back on to the boat in a standing position. 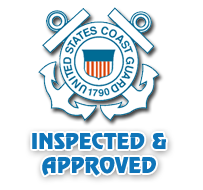 Our vessels are inspected daily and kept to very high mechanical standards. additionally, life jackets are mandatory for all passengers. In the unlikely event, flyers are gently lowered to the water and retrieved immediately. Parasailing is a waterport! The entire experience can be completely dry if requested, but the majority of people that have done this describe the “dip” as the BEST part. We definitely recommend it. 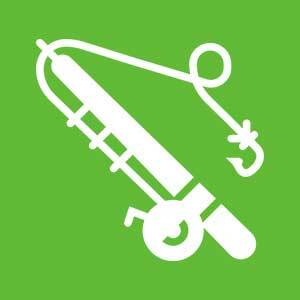 Please advise your captain as you get on the boat if you prefer to stay dry. We always do our best to accommodate your requests, however, safety is our #1 Priority. 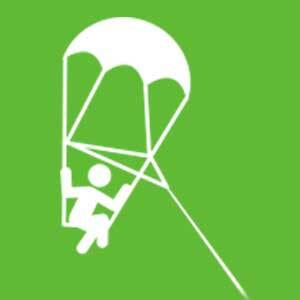 The parachute requires a certain amount of weight to fly safely. For this reason, small children or lighter passengers may have to fly with an adult or larger person. It is the Captain’s decision. Yes, when space is available. The cost for non-flying observers is $20.00+tax. Dont miss out on a moment of your family vacation; come along for the ride and watch the others have a blast. Although we must warn you, more often than not observers change their minds and actually go up in the air! Yes, we offer digital photo and video packages for purchase. 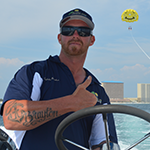 At the end of your experience we will provide you with 30-50 quality pictures of your entire parasail ride. The photographer will capture some of the most memorable moments as you relax and enjoy the experience. Additionally we offer our Go Pro Video package YOU strap to your wrist and will video your whole flight. Additionally we video every flight and you can purchase your videos at www.recordedrides.com.